Between last weekend and this weekend we have got a lot accomplished. First of all last Friday I said I was going to get three things done. First I wanted to get the babies room cleaned out. Her room has pretty much been a storage/guest room for eight years so we had A LOT of junk in there. 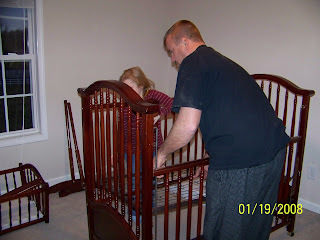 Second I wanted to get her furniture out of the attic and get it put together. Third I wanted to get this baby girl named!!! I am happy to report that I got two out of three of those things done. I'll let you guess which one I didn't get done or maybe these pictures will help! This weekend I wanted to get my baby registries done. I am also happy to report that I did get that done. We are registered at Wal-mart and Target. Tomorrow my crib bedding is supposed to be in, I can't wait to see it I hope it is as pretty as it looks on the Internet. After I get it I can get the paint matched and Kris can start painting. I can't believe I am going into week 24....man time flies. And yes Jennifer I know.......we need to see more belly pictures...working on that I promise! My "to do" list this week includes focusing really hard on baby names. Thanks to those of you who gave us suggestions. Kaylee got her 3rd six weeks report card and yes again she made straight S's and all +'s on everything that was evaluated. Her teacher even wrote on the back "GREAT JOB KAYLEE!" She is just doing so good in school and still loves every minute of it, I hope it continues. I'm glad you noted we need more belly shots :)....cuz we do!!! Poor Kris having to do ALL the work!! LOL!! Can't wait to see the finished room! !